This handy guide to Section 4.2 (Scottish Part M) explains what this regulation is and its various implications on lifts in building projects in Scotland. Read on to learn something new! What is Section 4.2 of the Technical Handbook? Section 4.2 is the section of the Technical Handbook building regulations in Scotland that refers to the accessibility and use of buildings. Section 4.2 lists the mandatory standards that must be adhered to in the process of ensuring your building is fully accessible to all building users. It provides rules around fulfilling the requirements of providing access to a building, within a building and between storeys. Section 4.2 is only applicable in Scotland, Part M is the English equivalent. What does Section 4.2 advise about vertical circulation? Section 4.2 covers the mandatory standards that must be adhered to in the process of ensuring your building is fully accessible to all building users, either when planning a new building or when adapting an existing one, advising that vertical circulation should suit both the building and the people who'll be using it. Circulation within buildings should allow all building users, including those who require disabled access to move freely and without difficulty at all times. This can be considered and achieved at the building design stage in accordance with British Standards BS 8300 - Design of buildings and their approaches to meet the needs of disabled people code of practice, however there are exceptions to the rule. Exceptions include building refurbishments and conversions. When converting a building, the requirements are to meet the standard ‘so far as is reasonably practicable’, with access being no worse than before (Regulation 12, schedule 6 in the Technical Handbook). What type of lift does Section 4.2 recommend? Although the requirements will obviously vary considerably depending on the type of lift you are installing and the building type in which you are installing it, there are some general requirements that apply. in dwellings, unassisted means of access is provided to, and throughout, at least one level. Exceptions noted include limited access, e.g. stepped access (in a residential building such as a hotel, to accommodation unsuitable for a disabled user) or (a raised area in a public building where an equivalent service is available on a lower level) – see Standard 4.10. Typically in non-domestic buildings with two or more floors, this means is a passenger lift first and foremost and a platform lift if it is not possible due to building or usage limitations. 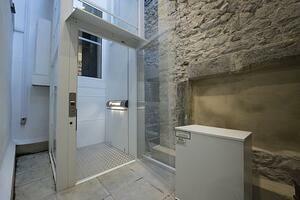 For smaller distances a platform lift can be the first choice. What are the general requirements for lifts under Section 4.2? two-way communication, operable by a person with a hearing impairment, that allows contact with the lift if an alarm is activated, along with a visual alarm indicator. What specific guidance is there to the type of lifts I might need to install? Generally, unassisted access between storeys should be provided by a passenger lift, with the installation meeting the recommendations of BS EN 81-70: 2003. However in some circumstances, when altering existing buildings or within new buildings with a small storey area, it may not always be reasonably practicable to install a passenger lift which is where an enclosed platform lift can play its part. 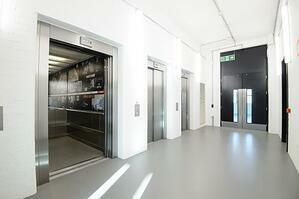 Where it's not possible or practical to place a passenger lift an enclosed platform lift is a suitable alternative. 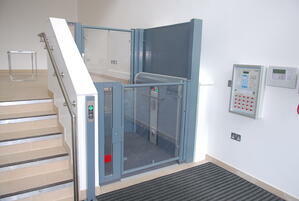 Like passenger lifts, there are additional recommendations for disabled access lifts. In addition to general provisions for lifting devices, a powered lifting platform, or platform lift should (if serving a storey to which the public have access) have a platform size of 1100mm wide by 1400mm deep and a clear opening width to any door of 850mm, or if serving any other storey, have a platform size of at least 1050mm wide by 1250mm deep and a clear opening width to any door of 800mm. provided with permanent and clear operating instructions adjacent to or within the platform. Whilst the regulations state platform lifts should be operated by "continuous pressure control, of a form operable by a person with limited manual dexterity" there are one-touch operation alternatives, like our Midilift Plus cabin platform lift range, enabling much easier operation. In such cases, where vertical travel is not more than 4.0m, the installation of a powered lifting platform, e meeting the recommendations of BS 6440: 1999 may be considered, such as our Lowriser wheelchair platform steplift range. How does Section 4.2 differ from Part M (England & Wales)? Most of the requirements of Section 4.2 are identical to Part M . However the platform size requirements do differ with the Scotland document, requiring larger minimum sizes for both low and medium rise platform lifts. There are also some additional recommendations surrounding lifts in buildings, namely the Equality Act, BS8300 design guidance which can be found in our blog - Building Regulations - Do I need a lift. Any of our platform and passenger lifts can adhere to the Section 4.2 requirements and our expert team are always on hand to provide you with a lifting product which is not only compliant to the relevant standards and regulations, but also blends effortlessly into your building aesthetics. A reputable lift provider will be able to assist you in your decision making, however, it's certainly worth being well-informed about these design considerations yourself. Here at Stannah we offer a broad range of products to enable easy vertical circulation, working with you to solve your access problem and comply to building regulations. Still unsure? No problem! Get in touch to speak to one of our experts.